With Easter just around the corner my team and I have been busy mustering up a few Primal friendly recipes for you and your family to enjoy. When it comes to the holiday’s my approach to Primal living will always be the same: Enjoy it in moderation. When it comes to my younger children, I still let them enjoy easter and the chocolate. I mean, I can’t be a total killjoy and put the Easter bunny out of business, can I? So here’s what I do… Instead of buying them the big Easter eggs we buy them the smaller ones and spread them around the garden so not only are they spending quality time together, but they’re also being active. Living Primally should be seen as a lifestyle and not a punishment. Having the odd day where you’re not putting your health first will not cause too many problems – just don’t let it become a habit! When it comes to myself for Easter I simply like to enjoy a Swiss bar which has over 80% dark rich chocolate. If there’s anything I would suggest when it comes to Easter and if you’re trying to be a little health conscious then it would be to have the dark chocolate that’s over 80%. Dark chocolate is much better for our health and it really does contain a few health benefits, too! You can read more about that in my book, Primal Cure. 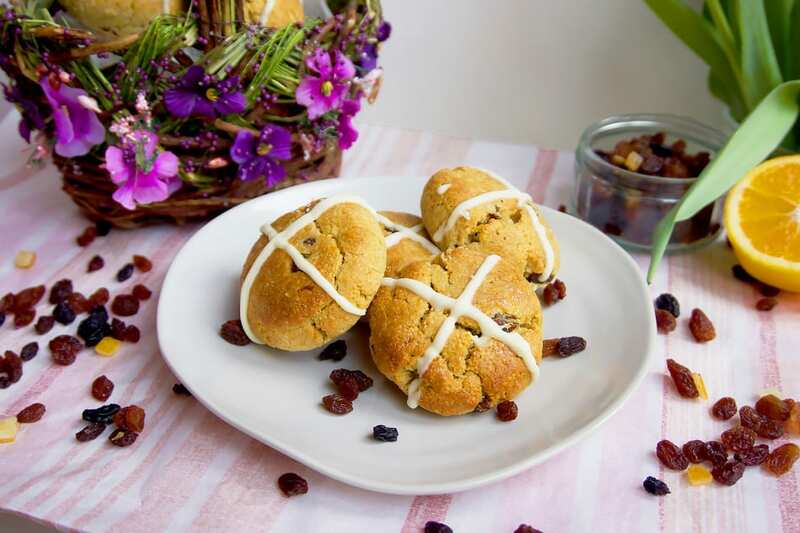 Instead, with my upcoming Primal Easter recipes, you can indulge the Primal way and enjoy some Easter treats that are low in carbs, contain no refined sugar and are free from those unhealthy heavily toxic fats! Not too bad, huh? I’ll admit though, taking the classic Easter hot cross bun recipe and turning it into a Primal friendly recipe wasn’t the easiest of bakes. 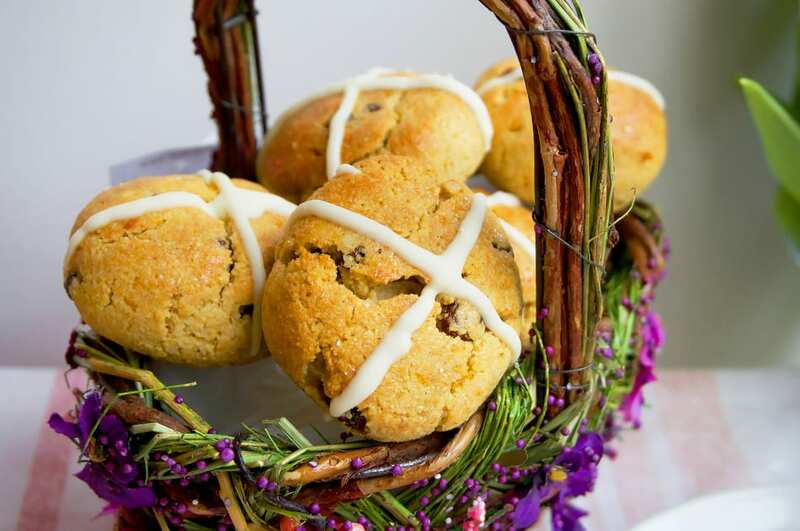 However, after a little baking science and turning the classic recipe into a grain free one, I was able to whip up these incredible primal low carb hot cross buns for Easter. 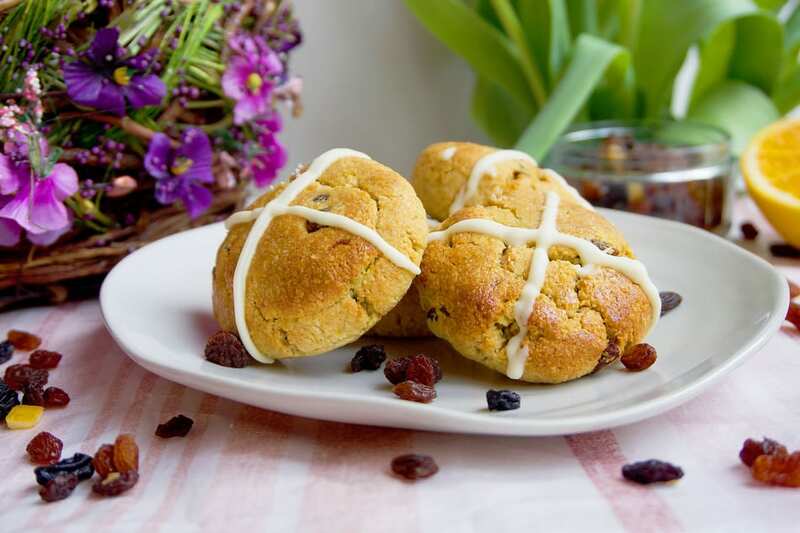 Not only do these Primal buns still manage to capture the exact spices of the traditional hot cross bun, but they’re incredibly moist, soft and sweet. I decided to stick to just raisins for this recipe as the traditional mixed fruit can sometimes become a little overpowering, not to mention quite high in sugar and carbs. 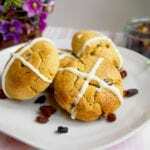 The raisins however, still make the recipe a hot cross bun classic and in my opinion, are much nicer! Just make sure you use organic raisins with no added sugar or oil! I’d recommend eating these fresh out of the oven or toast/grill them a little to get that added crisp. They’re incredibly moist thanks to the good fat’s from the almond flour so I’m not sure butter is even needed! Or, if you’re more of a baker and food giver then why not wrap these up and give them as an Easter gift to someone? The fact that they’re Primal doesn’t matter at all. I love surprising friends and family with Primal baking recipes as they can never guess that they’re healthy! 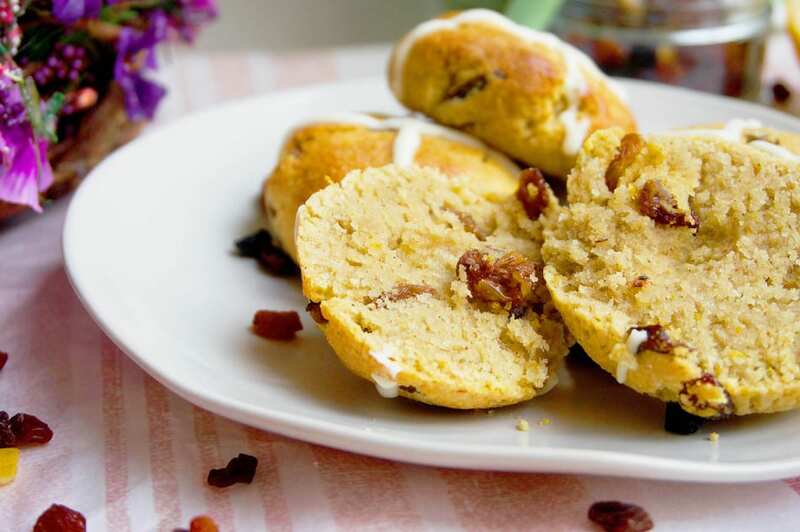 A Primal take on the classic Easter Hot Cross Bun Recipe. This recipe is low carb, contains no refined sugar and is dairy and grain free. All the flavour - minus the calories and 'not so good' for you ingredients! Begin by pre-heating your oven to gas mark 4. In a bowl, mix together your dry ingredients (including the raisins) and set aside. In a microwavable bowl, heat your coconut oil until it melts. Once it's melted leave it to cool down and then add your honey and whisked eggs. Stir until everything is combined. Grate your orange and add the zest to your dry ingredients and mix everything together. Once done, add the wet ingredients to your dry ingredients and stir until everything is combined and you have a stiff dough. Line a baking tray with parchment paper and using your hands, create a small round ball and place on the tray. Repeat this until you've used up all of your dough. You should have about 8 hot cross buns and they should all be roughly even in size. Using the palm of your hand, slightly flatten the balls and using half of your honey, glaze each ball. Once done, pop them in the oven to bake for 20-25 minutes or until golden. 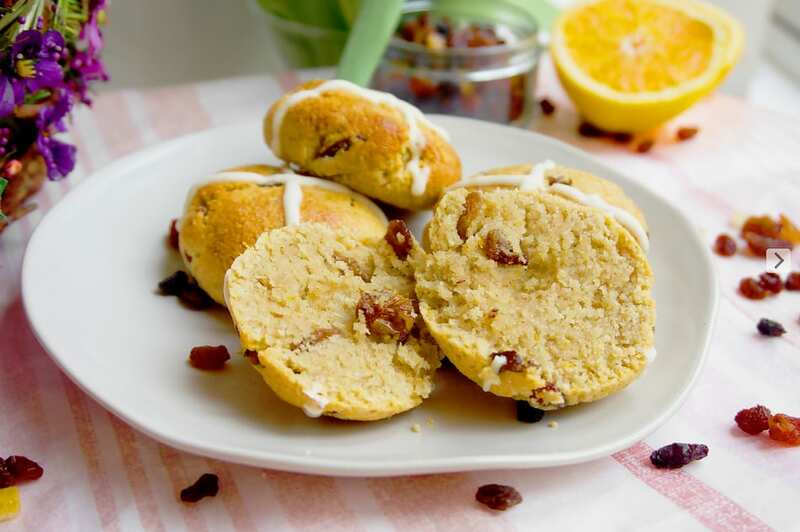 Remove your hot cross buns from the oven and once again, coat them with the remaining honey and leave to cool. Whilst they are cooling, make your cross mixture by simply adding enough water to your coconut flour until a paste forms. Pop this in a small piping bag and pipe crosses onto your buns. Once done, remove your buns from the baking tray, serve and enjoy!